War Horse is a paradox. At once an immensely heavy-handed film and something to be marveled at, it is hard to judge and harder to dislike. Initially, it is easy to dislike War Horse. The film is easily one of the most hackneyed, cliched and maudlin films Spielberg has ever made. There will be horrific fates in store for all the likeable characters. There will be redemption and the triumph of the human spirit hammered down our throats, and by golly, a small child will die of a horrific disease. Amongst all that, the music will soar and dip to tell us exactly how to feel and at which emotional register to empathise with, and the visuals will frequently hide the horror to keep its rating and yet hammer home the point by artfully concealing the obvious. Oh, and a noble animal will teach us all about the futility of war. Michael Morpurgo's 1982 book by the same name was a book written almost entirely from the horse's perspective, making it a unique little book that visited the horrors of war with a full vision and a personal scope. When it was turned into a play, the puppet-like horse created for the stage show added to the distance. Spielberg shuns all that to zoom the camera out and let us take in all that is he wants us to see and feel, never once relying on subtlety or cleverer devices. A drunken farmer wins a non-farm horse in an auction, and brings home the obviously special horse. 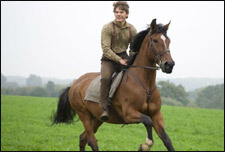 His son Albert (Jeremy Irvine) names the horse Joey, and immediately forms a bond with it. Together, they go through some start-stop arrangement of farming. As World War I begins, the horse is taken away by possibly the noblest of Englishmen portrayed by Tom Hiddleston, and subsequently survives being shot at and being attacked, being caught by the Germans, and spending time in Belgium, to the extent that it almost feels like Joey's Amazing Adventures In Europe. Albert also conscripts, and we see many glorious European fields and skies before their inevitable reunion. The film is trying to tell personal human stories through the device of Joey moving from one pair of hands to the next, and that is where the conflict in the quality of the film arises. The vignettes are acted by some of the best talent in the business, and they sell their parts really well. The cream of fresh British talent is used to deliver one of the finest ensemble acting jobs of last year in one film. Not only do they sell their predicament, your eyes well up despite knowing that the music is all hokum. The film is also incredibly gorgeous - especially when focusing solely on the vagaries of human existence during war. Spielberg is a master at eliciting emotion, and he uses great restraint to do so in some of the most personable sequences in the film. It is the points where the film focuses on personal stories, and disregarding the larger war, when the film rises up to become something special. Ultimately, in using the humans to deliver the story, Spielberg weaves a sort of movie magic to spell-bind us in his art - something that is rare these days. This is why I'm so divided on the film. The personal human moments are lovely and beautifully acted. Great subtlety and amazing craftsmanship are at display, and the film rises to the occasion of the grand human drama. On the other hand, the larger war sequences, and the way the plot is handled to bang us on our heads with The Message, feel unwanted and not nuanced. This dichotomy exists, and yet the film comes out on top. It has many flaws, but you are guaranteed to be caught up in the moment, and your heart will reach out to Joey and Albert's story. We are fortunate to live in a time when a filmmaker like Spielberg operates at the top of his game even after so many films. If only he showed the same amount of restraint in every frame. Be the first to comment on War Horse! Just use the simple form below. fullhyd.com has 700,000+ monthly visits. Tell Hyderabad what you feel about War Horse!